Any semblance of a serious review just got killed in a hail of ninja stars and cheap looking swords. Two minutes later we are gifted the sight of a mostly shirtless synth band called ‘Dragon Sound’ playing to a half full nightclub, with the lyrics containing such gems as ‘Bikers by days, ninjas by night’. How could all of this wrong add up to something so very right? Well it totally doesn’t, but I fully understand and acknowledge the drinking game potential. After all, if a film with motorcycle ninjas, a band full of kung-fu masters who seems to run into trouble at every turn, and a ‘rival’ band who swears vengeance AFTER DRAGON SOUND ARE CHOSEN OVER THEM AS THE CLUB HOUSE BAND – who wouldn’t need a drink? The plot is as confusing as it sounds, the dialogue sounds like every ‘actor’ is reading from a different script, and the montages of kung-fu training helpfully slow down enough so that we can clearly see just how far away from the target these alleged ‘strikes’ are. 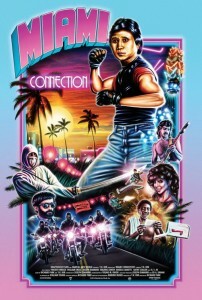 Miami Connection is an insanely inept film full of non-actors and terrible filmmaking decisions. It makes no sense and has no genuine entertainment value. Somehow despite all of this it is the most enjoyable ‘4 / 10’ ever.